Below we reveal our picks for the best cordless string trimmer and best corded electric string trimmer. We also review the top 10 cordless and the top 5 corded models. We already took a look at gas powered string trimmers here so go there if you are interested in that type. If you are interested in purchasing a a new string trimmer, or weed eater as they are sometimes called, you should be aware of the 3 different types you can get. There are units with gas powered engines, corded electric motors, and cordless battery powered versions. Gas powered models are the most powerful and provide the most range, but are also the loudest, heaviest, most expensive, and need to be refilled with gas or a gas/oil mixture for 2-cycle engines. They work great for home owners with large yards and fields or professionals who need to cut thick vegetation. Cordless string trimmers powered by a battery have really improved in the last few years and the top models can now compete with their gas-powered brothers. They are a good choice for everything from small to large yards, but are limited in run time unless you have another battery. They are generally cheaper and lighter than gas engine versions, while more expensive and heavier than corded electric options. Be aware that the performance and price will vary greatly between different models, so you will need to decide which one will work for you. 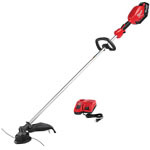 Corded electric string trimmers are great for small yards. They are limited by the length of the extension cord you use with it, but they are very cheap and quiet. At the bottom of each section we also include a comparison chart so you can easily compare one model versus another. 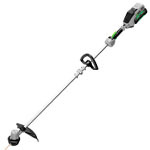 We selected the $229 EGO ST1521S as the best cordless string trimmer. Powered by a 56V 2.5 Ah li-ion battery that can last up to 45 minutes, this thing has more than enough power to handle thick weeds and tall grass with ease; all while weighing less than 10 pounds. A couple of innovative features are true highlights of the EGO ST1521S. First is a carbon fiber shaft that comes with a lifetime warranty. The other solves maybe the most frustrating part of trimmers – loading the line. This new Powerload head design makes loading the line super easy. Just stick the line through the slot, even up the lengths on each side of the head, then press the Powerload button and watch it wind the line into place. Some other features of the ST1521S include a 15 inch cutting swath, .095″ line, variable speed control, and a 5 year limited warranty. The combination of power and ease-of-use make buying the EGO ST1521S a no-brainer if you want the top tier battery powered string trimmer. 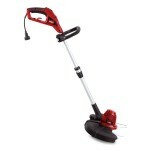 The 58V Echo CDST-58V2AH sells for $249 and could be considered a professional grade string trimmer. 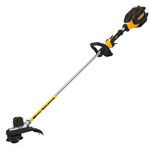 Its high torque, brushless motor provides the power to tackle tough trimming and edging jobs. In fact in terms of edging it is superior to the EGO ST1521S. With an adjustable cutting path of 14-16 inches, a variable speed trigger, and a High/Low Speed switch you can control it for extended run time or more aggressive cutting. This Echo CDST-58V2AH comes with a 2.5Ah battery that will last for about 45 minutes on the Low setting and about 25 minutes on High. It has a 52″ shaft length and weighs 10.3 pounds. You should consider the Echo CDST-58V2AH if you want the most power you can get, but still have some adjustability to lengthen your run time. The EGO ST1502SF does not have the Powerfeed head or carbon fiber shaft like the ST1521S, but it does have the same 56V battery and motor. This saves the buyer $50 since this model costs just $179. Weighing a just a hair over 10 pounds this thing is well-balanced and easy to maneuver. The EGO ST1502SF has a 15 inch cutting path, uses .095″ line, and has a 2.5 Ah battery that can last up to 45 minutes and be recharged in 50 minutes. 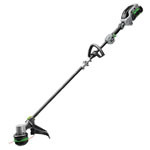 You should buy the EGO ST1502SF if you want the best battery powered string trimmer priced under $200. With a price of just $149, the Ryobi RY40220 is probably the best value you can get in a cordless string trimmer. It was also rated as a Best Buy from the leading consumer magazine. While not quite as powerful as any of the 56V models on this list, the RY40220 is powered by a 40v lithium-ion battery that has the power to handle almost any job and can cut through most grass and weeds with ease. The 2.5Ah battery will last approximately 45 minutes and takes 90 minutes to recharge. 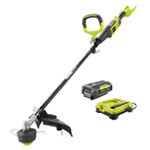 The Ryobi RY40220 is easy to use, although at 11.5 pounds it is a bit heavier than other cordless and electric models. 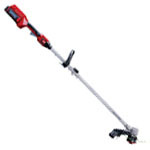 It has a straight 50.5″ shaft with an adjustable 13-15 inch diameter cutting path using .080″ line. We recommend the Ryobi 40220 for home owners with mid-sized yards up to 1 acre. The Milwaukee 2725-21HD is a good battery powered string trimmer, but it is tied for the most expensive on our list at $249. For power this Milwaukee yard tool uses its popular M18 Fuel 18V system which makes it a good choice if you already have other M18 Fuel Milwaukee cordless power tools since you can swap batteries if needed. Thanks to the included 9 Ah battery you get the most runtime of any trimmer on this last at up to 60 minutes. The Milwaukee 2725-21HD can edge and trim surprisingly good for an 18V system. It has an adjustable cutting swath of 14-16 inches, can use line of .080 or .095 inch, high and low speed settings, and a variable speed trigger. While this thing performs really good, we feel it is only worth paying this price if you have other Milwaukee cordless tools or if you want the maximum runtime you can get with just one battery. The $235 DeWalt DCST990M1 is another trimmer that can handle tough overgrowth. The power comes from a 40V Max 4 Ah li-ion battery combined with a patented gear drive designed to amplify torque when needed. A variable speed trigger and a Hi/Lo speed control switch lets you use the precise power needed while extending runtime when needed up to 60 minutes on the Lo setting. The DCST990M1 can use .080″ or .095″ line and the bump feed head cuts a 15″ path. It weighs 13 pounds which is the heaviest on this list. Even though the DeWalt DCST990M1 performs well, we think there are other models that offer a better value. However, if you already own and use other DeWalt 40V tools then this one would be a good addition to that lineup. Priced at $172.85 the Toro PowerPlex 51482 is a decent buy. A 40V max 2.5Ah battery provides enough power to tackle long grass and weeds, but does not perform as well when edging. A variable speed trigger lets you control the power and thus the run time of up to 40 minutes. The battery can recharge in about an hour. We feel there are better options in this price range, but if weight is a serious concern for you then you might want to consider the Toro PowerPlex 51482. 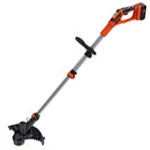 The $132 BLACK+DECKER LST136 can work well for anyone who wants a light string trimmer for small to medium sized yards. The LST136 is powered by a 40v lithium-ion battery which will last between 20-45 minutes depending on your power setting and can recharge in about 30 minutes. 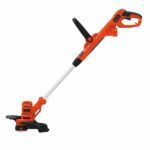 With a 13-inch cutting path and .065″ line it has enough power to cut regular lawn grass and some weeds, but it bogs down when trying to slice dense vegetation. The main advantage of the LST136 is its weight of just 7.8 pounds. 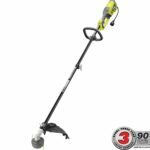 Combine that with a telescoping shaft and a rotating head for easier edging and you have a battery powered trimmer that is easy to use. The Ryobi ONE+ P2080 can give you up to one hour of run time at a price of $129. It is powered by an 18V 4.0 Ah lithium battery that can be recharged in 2.5 hours. You can also take advantage of using the over 100 other Ryobi 18V ONE+ cordless tools that use the same batteries. The performance is good, but it can struggle with thick weeds or grass. The P2080 weighs just 7.5 pounds, has an adjustable cutting width of 11-13 inches, uses .080″ line, and has a 90° pivoting head swings out for easy walk-behind edging. With its long run time, we would recommend the Ryobi ONE+ P2080 for someone who has a large yard that is not overgrown and who wants to take advantage of the ONE+ system to use other cordless tools as well. 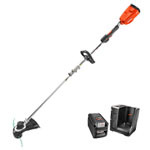 The $70 BLACK+DECKER LSTE525 is the best selling cordless string trimmer on Amazon. It is our pick for the top string trimmer under $100 as well. The LSTE525 uses a 20V max power system. It comes with two 1.5 Ah batteries that only last about 15 minutes each. Performance wise the BLACK+DECKER LSTE525 is by far the poorest on this list, but it can handle simple yard grass just fine. It really only should be used for small yards that are not too overgrown. Some other specs on the LSTE525 include a weight 5.3 pounds, a cutting swath of 12 inches, line diameter of .065 inches, 2 speed control, wheeled edger, and push-button line feed with no bumping required. 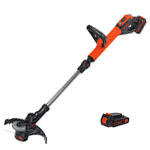 You should only consider the BLACK+DECKER LSTE525 if your primary concerns are weight or price and you have a small yard. 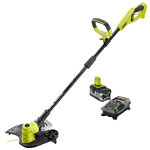 We chose the $70 Ryobi RY41135 as the best corded electric string trimmer. It received the highest score from the leading consumer magazine and users on HomeDepot.com rated it a 4.6 out 5 stars which was much higher that any other electric model. The RY41135 has a 10 amp motor with a straight shaft and a bump line-feed that cuts a large 18 inch diameter path. It weighs 11 pounds which is a bit heavy compared to other electric versions, but has as much or more power than any other one as well. In fact it competes with the top cordless models as well. The Ryobi RY41135 is the perfect choice for anyone who wants a corded electric, but needs an extra oomph to slice through thick grass or weeds. 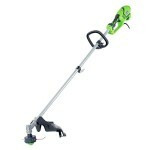 The Greenworks 21142 is another 10 amp electric trimmer and sells for about $60. It has a straight shaft with an 18 inch diameter cutting path using .080-inch line. That 10 amp motor provides enough power to cut through tall grass and weeds and while decent, it does not excel at edging. Overall the 9.9 pound Greenworks 21142 is another corded electric model that we highly recommend for home users with a small sized yard. The Black+Decker BESTE620 is a good value buy thanks to a low price of around $32 and decent power provided by a 6.5 Amp motor. It cuts a path 14 inches wide with .065-inch line. With a weight of just 7 pounds it is light enough for anyone to use. It converts to a a wheeled edger with just a simple rotation. The Black+Decker BESTE620 makes a great choice for anyone who wants an affordable corded model. Another model which sells for right around $40 is the Toro 51480. It has a 5 amp motor with a straight shaft that cuts a 14 inch swath. It weighs 7.5 pounds and has just a bit less power than the B+D BESTE620. Two features we like are the automatic line feed and guide wheel to assist you in edging, however sometimes the line feed doesn’t quite work right. It is also available at Home Depot. 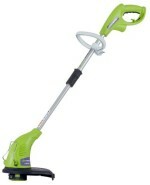 The cheapest corded electric weed eater is the GreenWorks 21212 which sells for about $31. It only has a 4 amp motor which is not very powerful and cuts a 13 inch swath. The main advantage of this unit besides the price is the weight – it is the lightest trimmer you can buy at just 5.2 pounds. Because of the low power, we only recommend the Greenworks 21212 for home users with very small yards. It is a good buy for those users since it is the cheapest and lightest you can get.